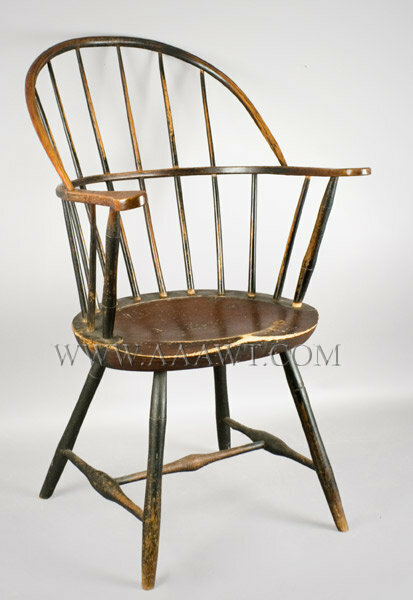 The easy chair frame is in very good structural condition with only trivial minor repairs. 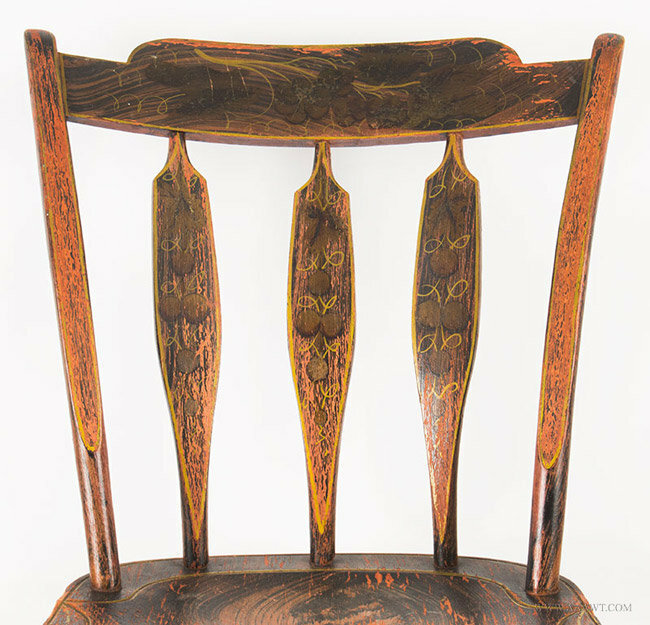 In May of 1990 Alan Miller harvested 11 small wood samples for microscopic examination by Harry Alden, wood anatomist, who at the time was employed by the Winterthur Museum. (Now in private practice, the go-to lab) The three-page report supports American manufacture [report is available to interested parties]. 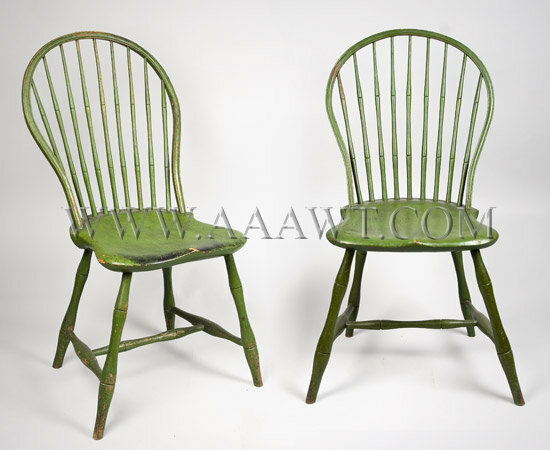 From a design point of view, if construction details are not considered, considering known American easy chairs…this example most resembles chairs from New York or the area from Virginia to South Carolina. 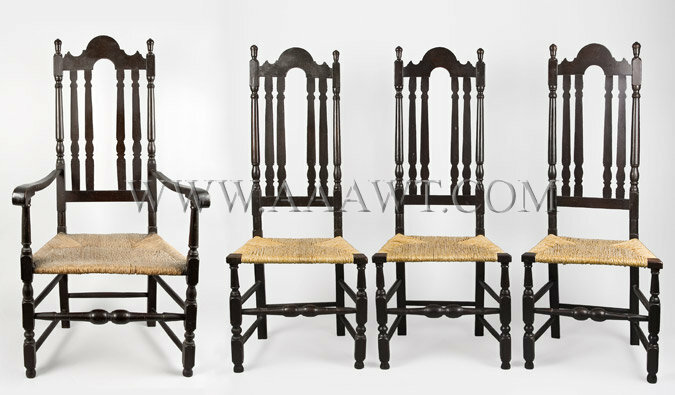 To make a regional attribution with any hope of accuracy, the chairs design, construction and wood species details must be considered and reconciled. 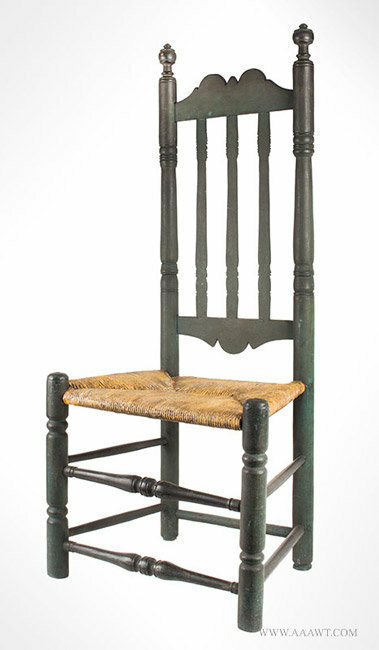 Two of the hardwoods in this chair, black walnut and live oak, are of unquestionably American origin; collective range is from Northern Virginia south. 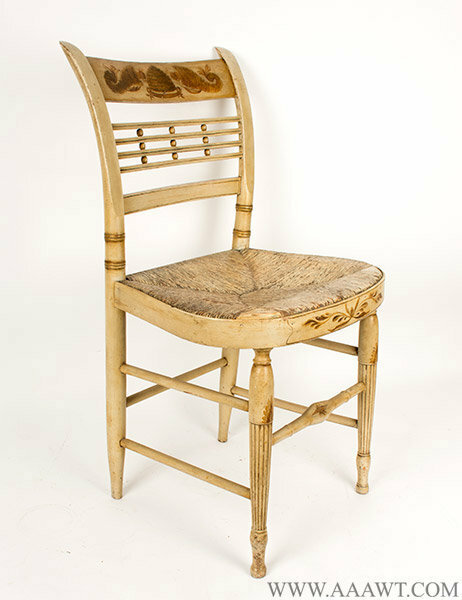 (Please call or email Dave to discuss other wood species used in this chair and/or to receive a three-page report. 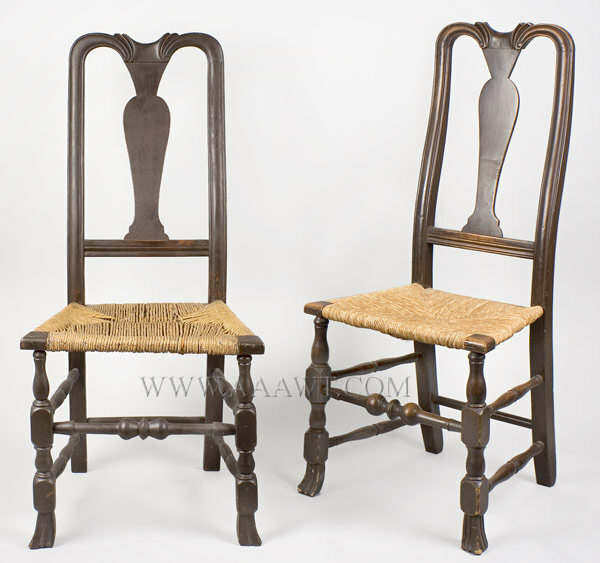 The chairs quirky construction is likely the product of a rural or small village shop. 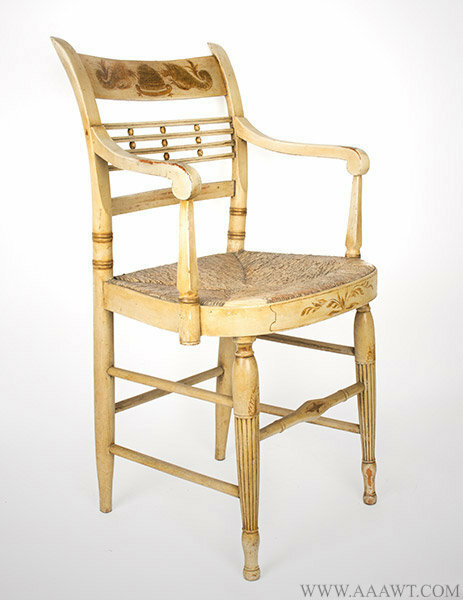 It is possible that this chair is from a previously unknown shop in New York and the live oak came north on coastal shipping…if this were the case, the spruce and/or red pine could be either local or imported (Unlikely that a rural shop had access to imported woods). 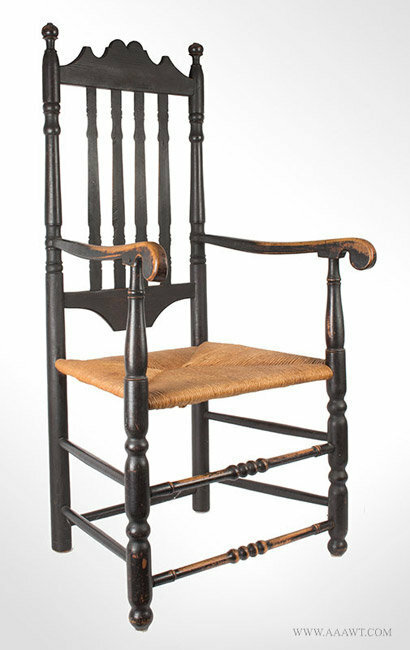 While this theory is certainly possible, a fair amount of documented New York furniture is known and none of it resembles this chair in terms of construction mentality. Maryland or Charlestown were possibilities yet have been rejected for similar reasons. As for regional attribution, coastal Virginia or North Carolina, especially Virginia is favored and logical. 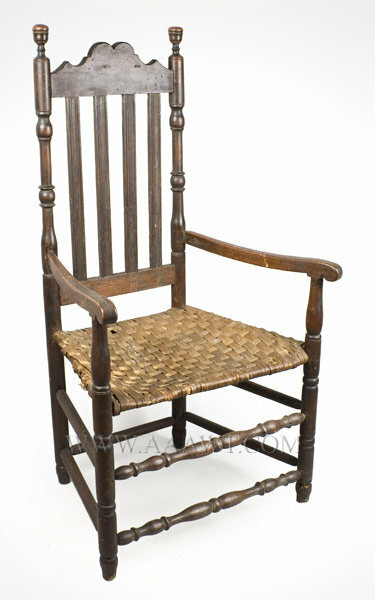 Even with this regional attribution we must patiently wait for a similar chair with known history to present itself, however, the attribution is reasonable and plausible. 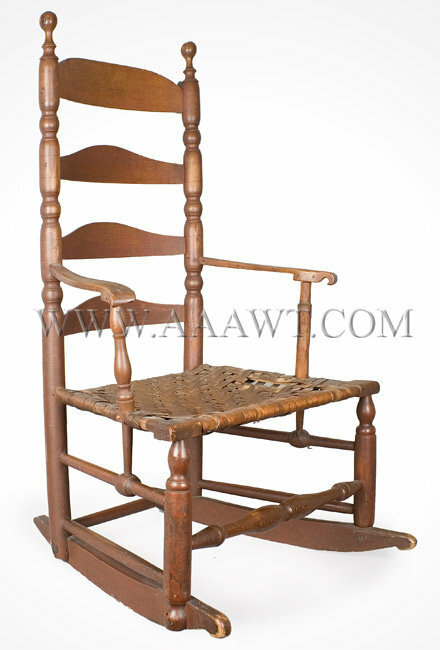 In any case, this is a charming and pure, rare American chair displaying great individual character. 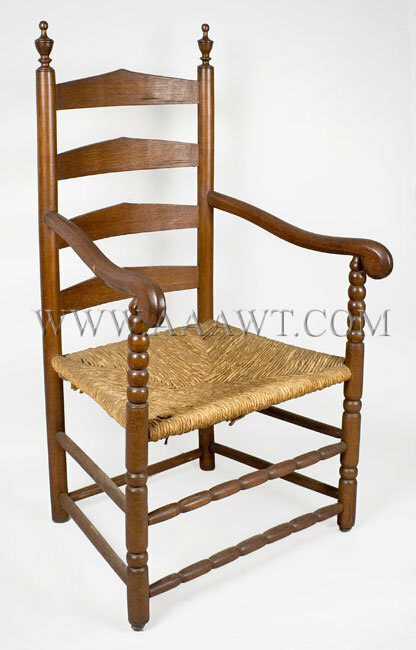 The chair is clearly an 18th century American antique made in what can be broadly described as the Anglo-American woodworking tradition with construction details and wood use choices common to no other style center. 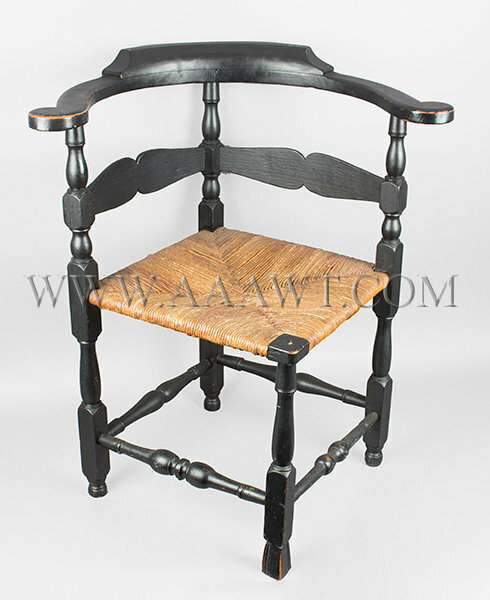 It is a product of a professional chairmaker or makers, however the workmanship habits do not correspond to those of any known urban center and display individualistic mentality which is internally consistent and, in a way, rational - although very quirky and idiosyncratic compared to the product of someone with standard apprenticeship training. 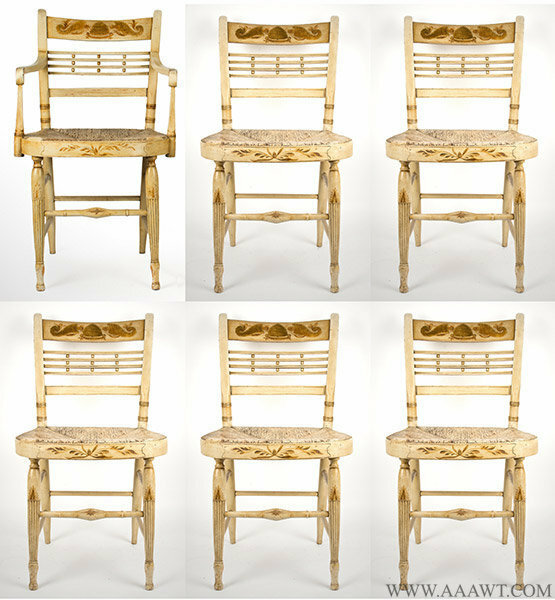 The chairs frame, in several aspects, is the easy chair reinvented; its form realized and approximated in novel ways. 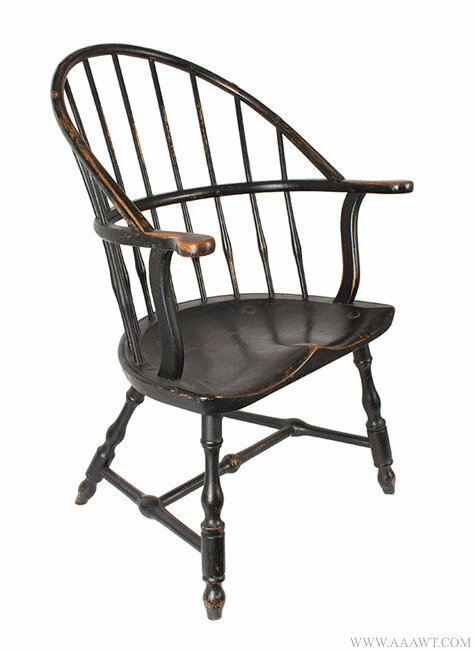 The aforementioned suggests a rural, or at least, enclaved, origin for this chair; its maker could have arrived at his own solutions to the problems of chair frame construction without pressure to conform to more standard local practices. 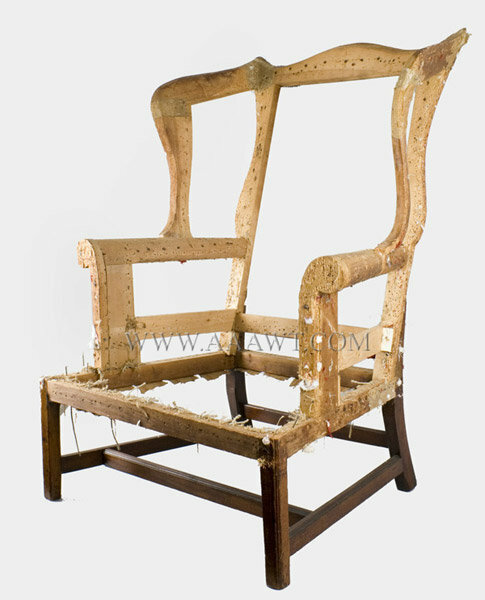 If there were no standard local practices, then this pressure would not exist suggesting that the chairmaker with professional skills but without firsthand easy chair frame making would logically have invented his own methods to arrive at his idea of the current chairs joinery and form. 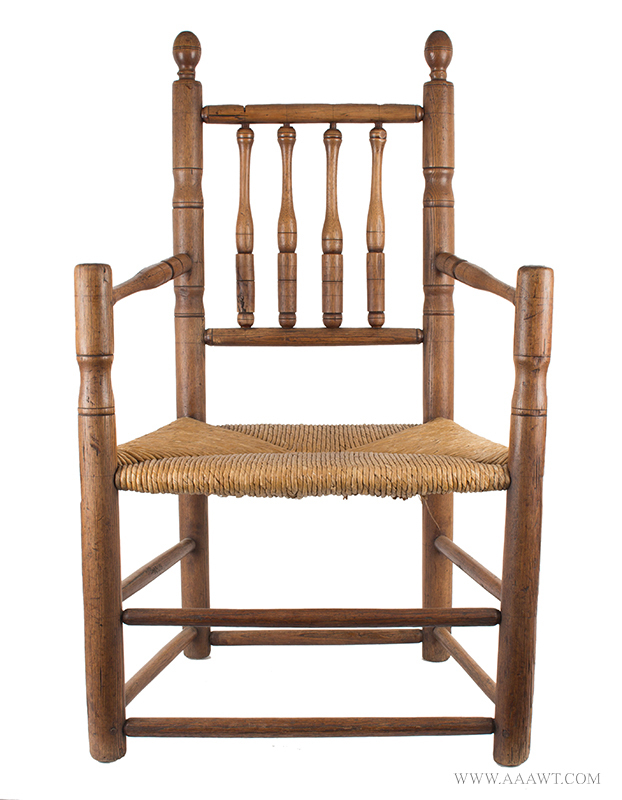 Two other general explanations seem possible; the first is that there existed a shop or regional tradition for technically making chairs like this. 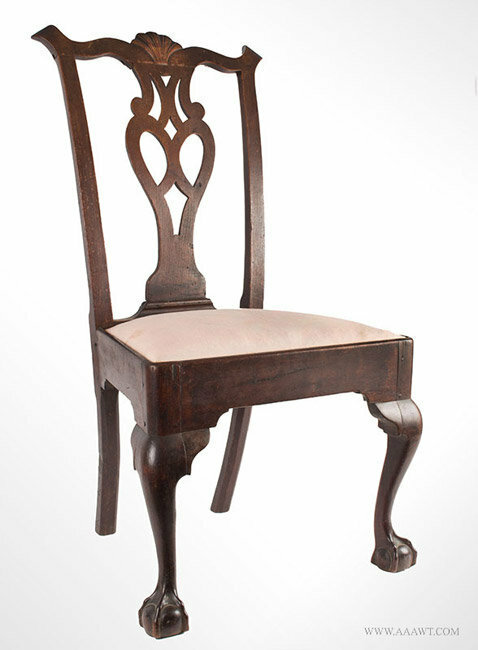 However, if this were so, more chairs made like this should exist and may one day be published. 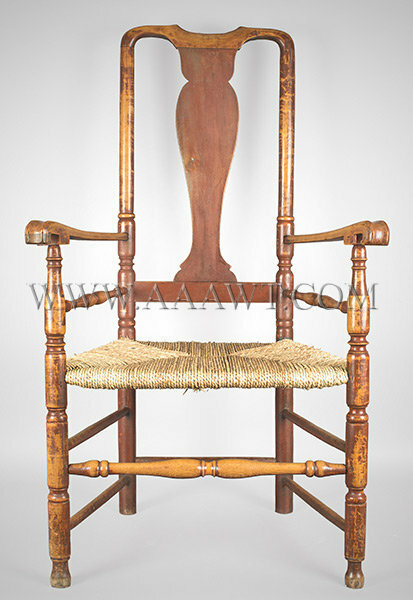 The second is an extrapolation of the first idea…if a chairmaker were trained to make chairs using this technique, he could have traveled to a new area and set up shop making products according to his habit and training. 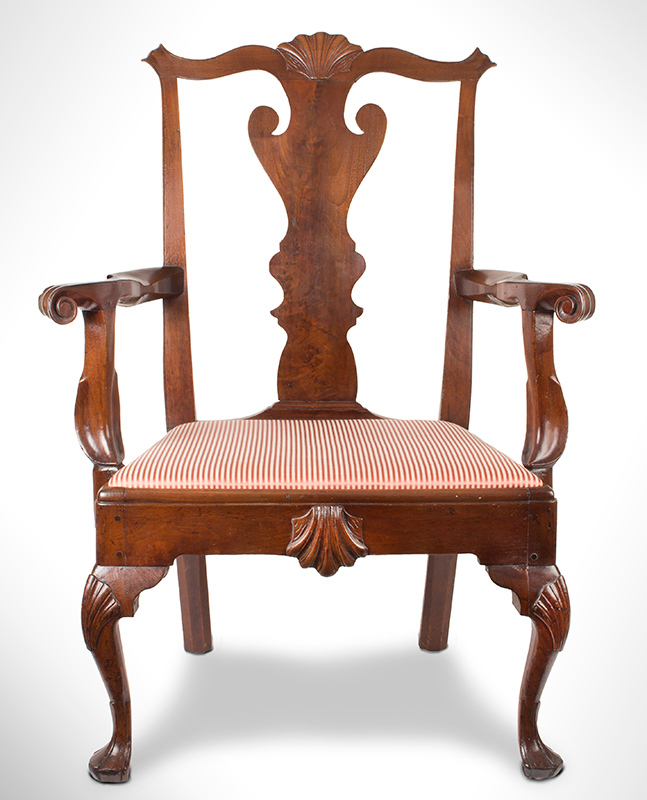 See, Joseph Downs, American Furniture – Queen Anne and Chippendale Periods; plate 83 for an easy chair of similar design, circa 1745 – 1755, probably Virginia. 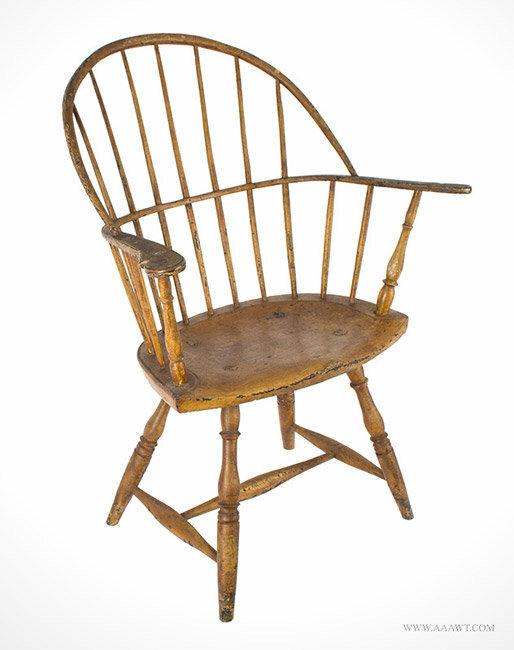 Purchased by James Kilvington  at Wilson’s Auction (Lincoln, Delaware) from the Dashiell family sale, they settled in Gloucester County, Virginia in the mid-17th century; members of this family later moved to Dorchester and Wicomico Counties, Maryland. 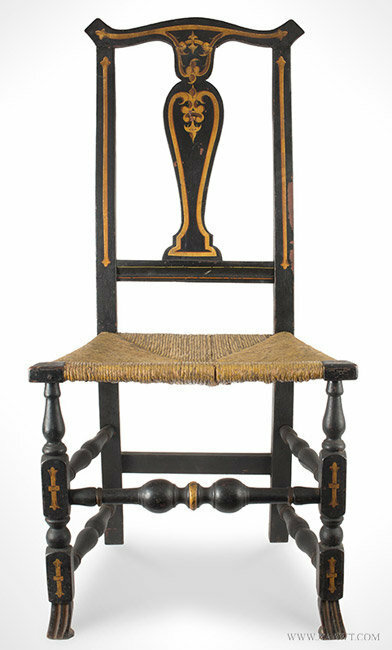 To Ronald Pook in 1990, to our consignor, a private Virginia collector. 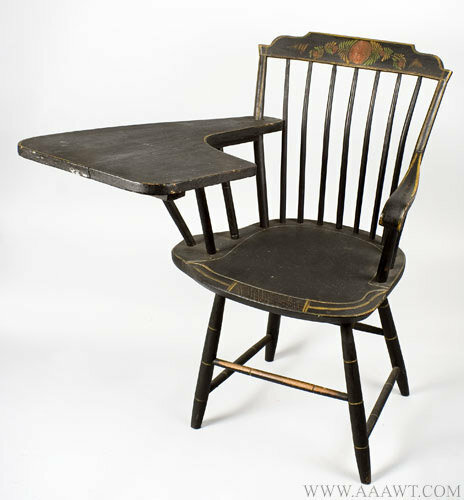 Height to top rail: 44.25”, height to armrest at cone: 25.5”, seat height: 16” without cushion, seat depth: 17.5”, width of top rail: 25.5”, width measured at front of wings: 29”, armrest with measured at outside of cones: 36.5”. 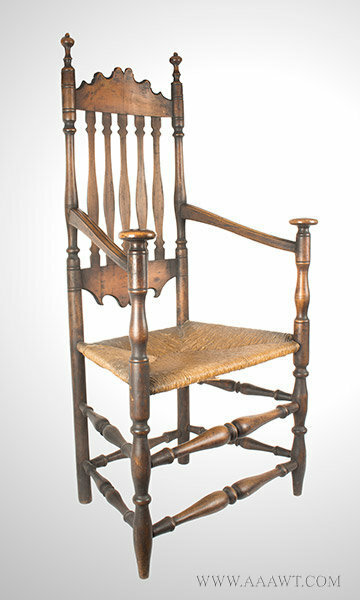 Turned stiles featuring large finals joining vertical and horizontal spindles; down swept turned arms; posts joined by trapezoidal rush seat above box stretcher. 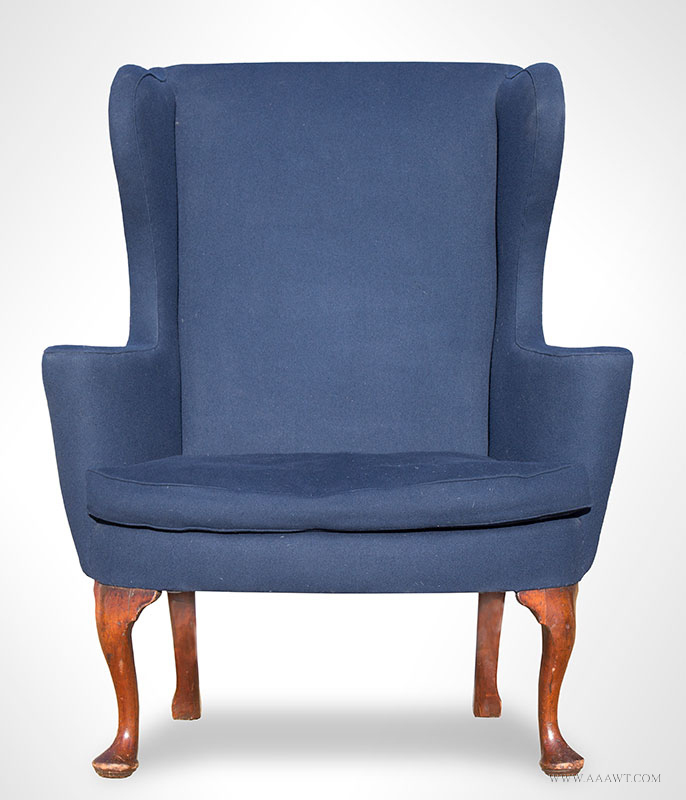 Graceful and inviting armchair of generous proportion. 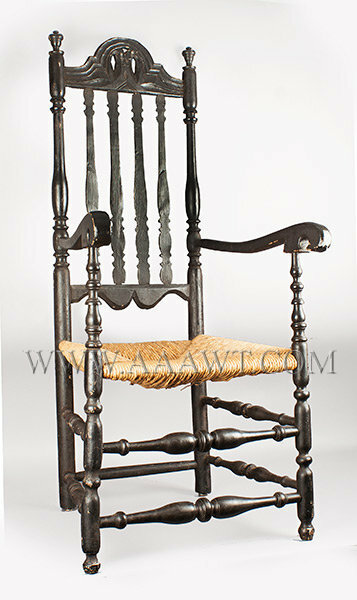 Serpentine crest rail featuring backswept knuckled ears and carved shell in center, beading on upper edge. 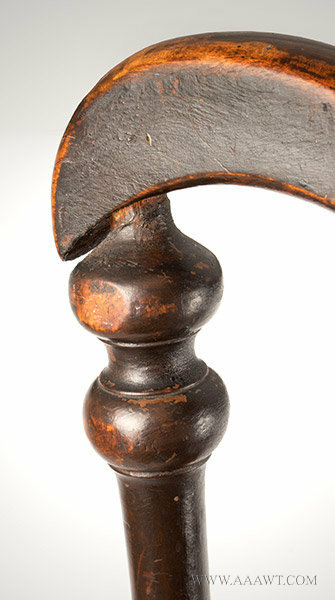 Baluster splat sits in carved keeper shoe. 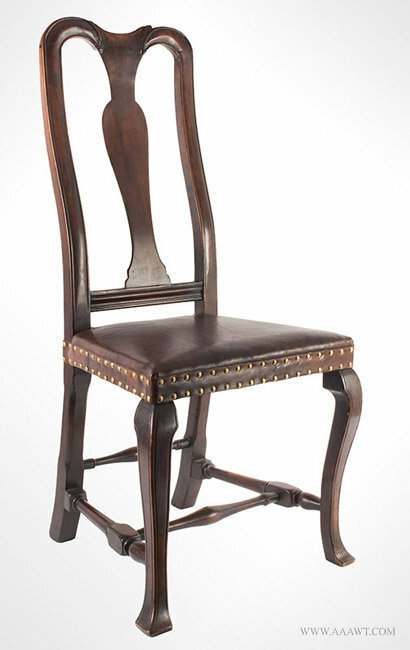 Stiles with beaded outer edges continue to backswept chamfered legs. 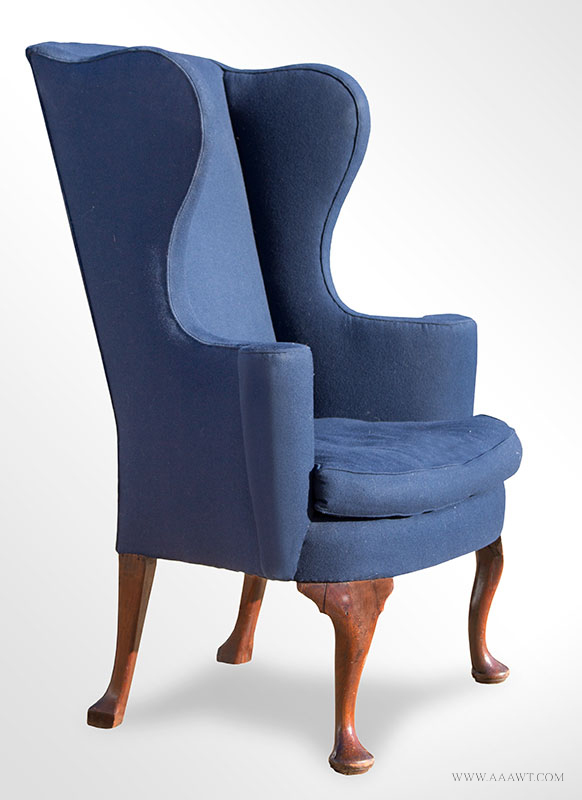 Cyma curve arms with scroll knuckled terminals are supported by cyma curved arm supports attached to trapezoidal slip seat rail with screws on interior surface. 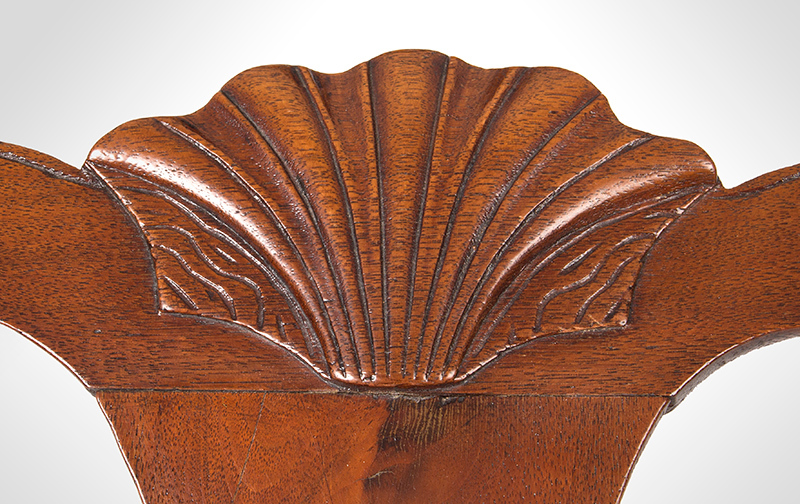 Single shell carving on front seat rail echoes that on crest rail. 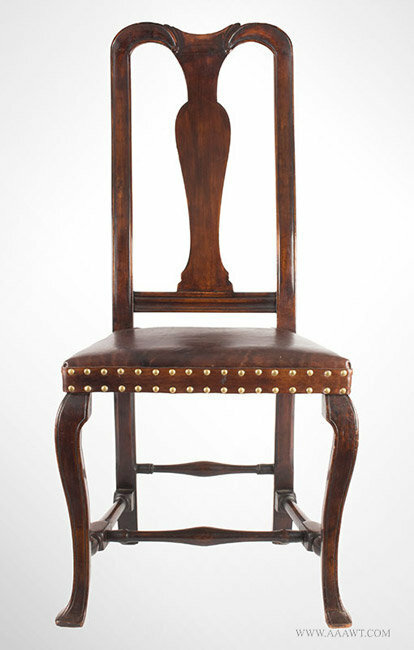 Cabriole legs with shell knee carvings terminate in trifid feet. 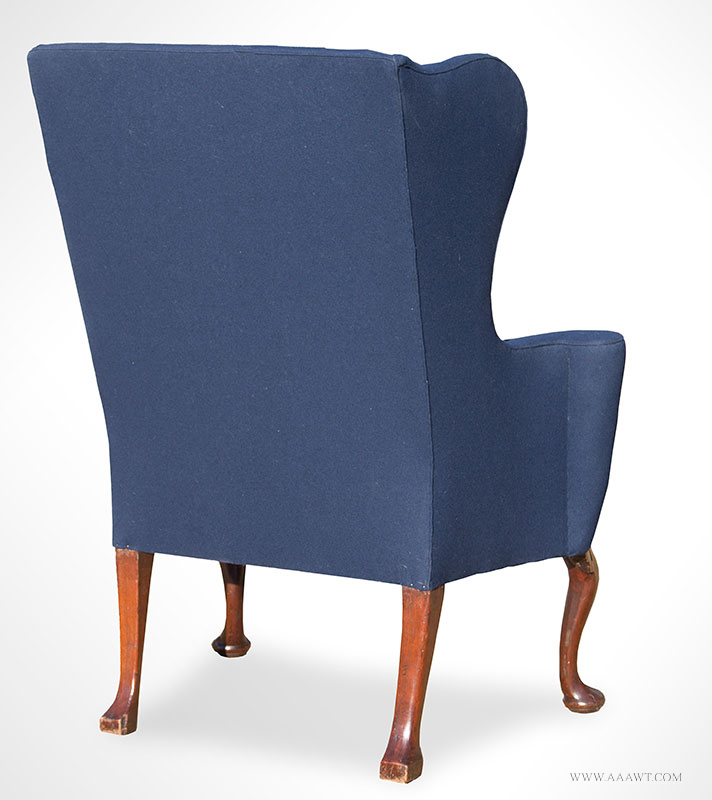 Yoke back side chair with vasiform splat, convex demi-lune front apron. 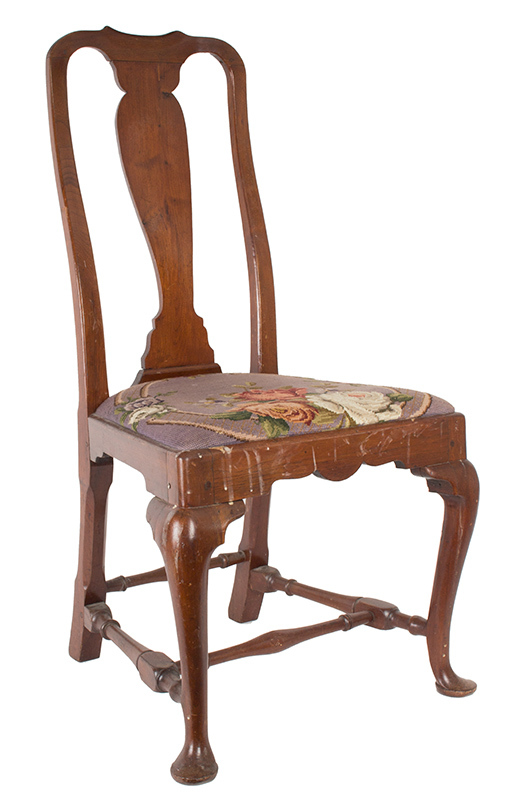 [Trapezoidal slip seat covered with later embroidered textile.] 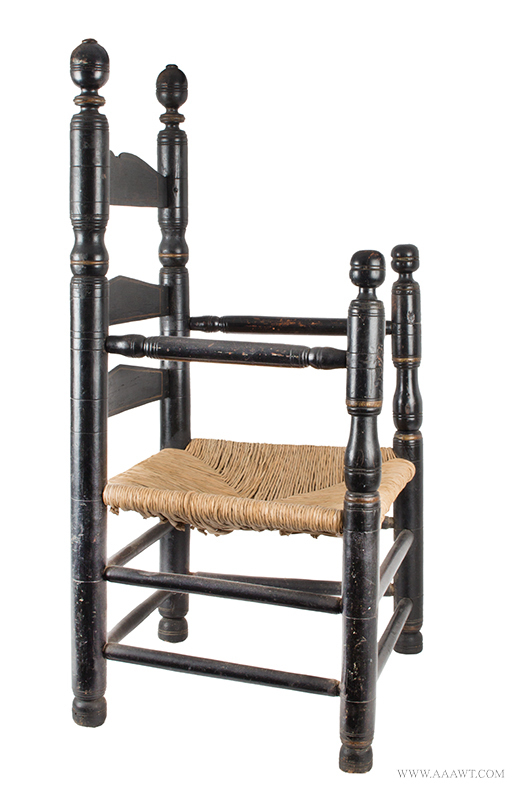 Front cabriole legs terminate in pad feet, rear legs are square and canted with lambs tongue chamfering, braced by block and turned stretcher. Minor split in proper left side knee block. Legs supported by block and vasiform turned ‘H’ stretcher construction. 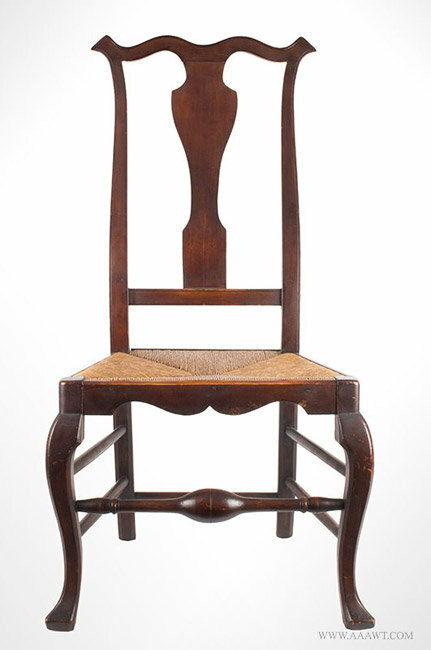 Featuring cupids bow crest and vasiform splat, over a rush seat with applied scalloped skirts [restored] raised on rear raking-chamfered-legs, chamfered cabriole front legs joined by a bulbous medial stretcher, terminating in crooked feet. Please call for additional information, and/or enthusiastic discussion. 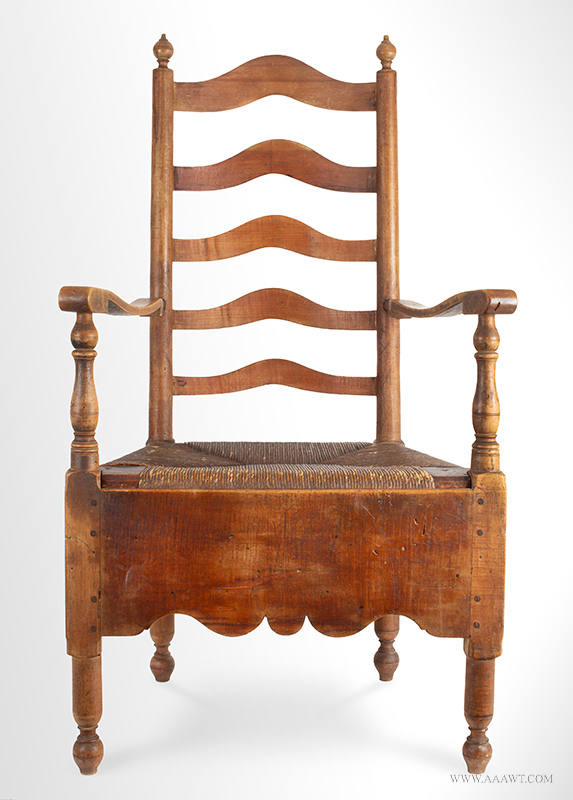 H: 45"; W: 20.5"; D: 19"
This monumental chair may fill this gap in the object record. 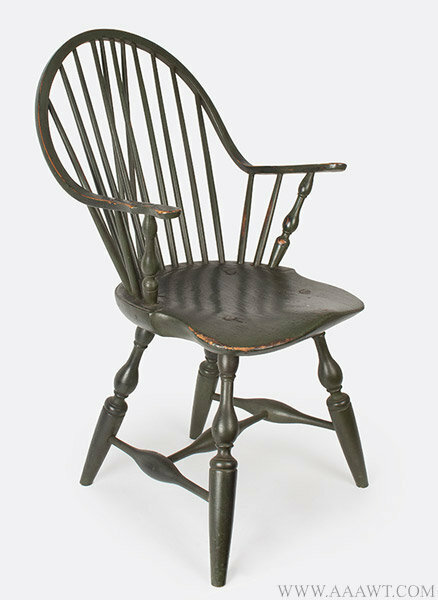 While the chair assumes the basic configuration of archetypical New London County turned-chairs, it exhibits subtle structural and ornamental variations that suggest a probable earlier date of manufacture. 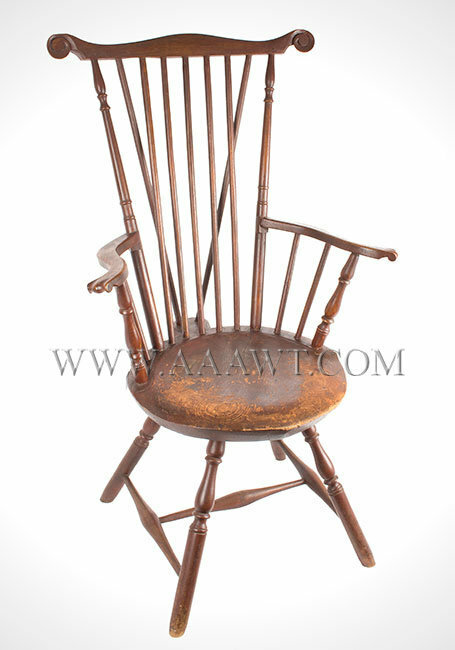 Overall, the chair is larger and more substantial than the standard New London County turned-chair. 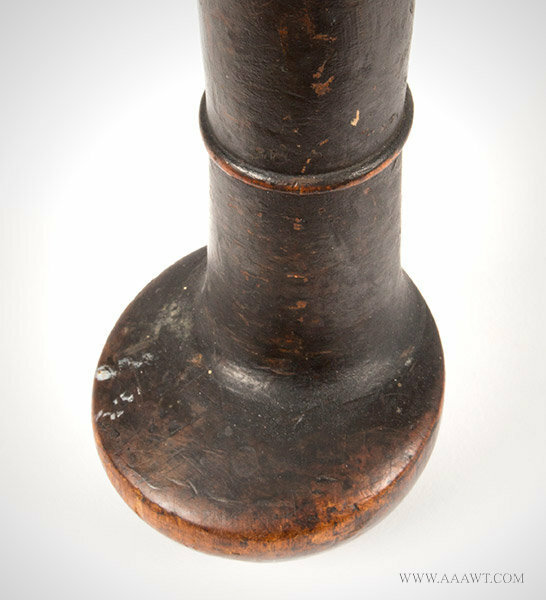 The posts are massive, exceeding 2.5" in diameter. 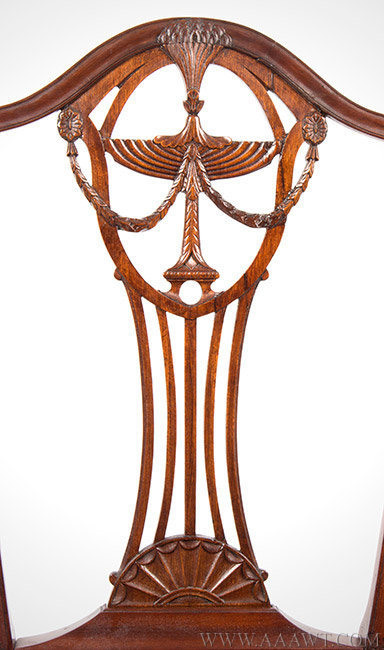 The finials are the tallest and most robust examples known. 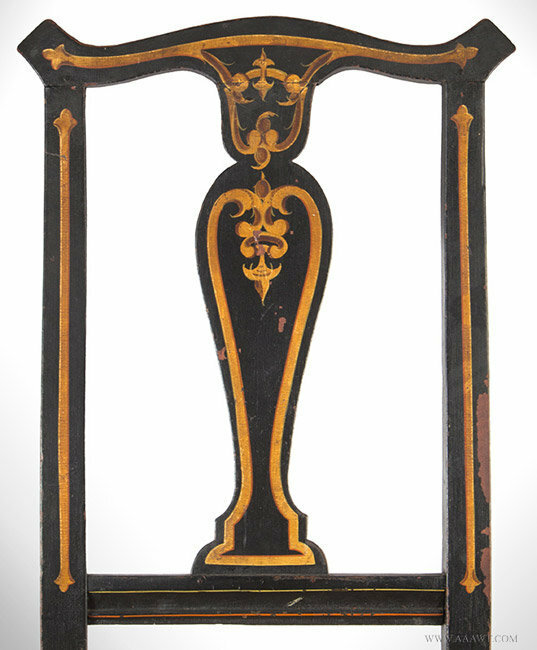 The posts are turned with a dense sequence of urns, rings, and incised lines that reflects the compressed character of mid 17th-century turned ornament. 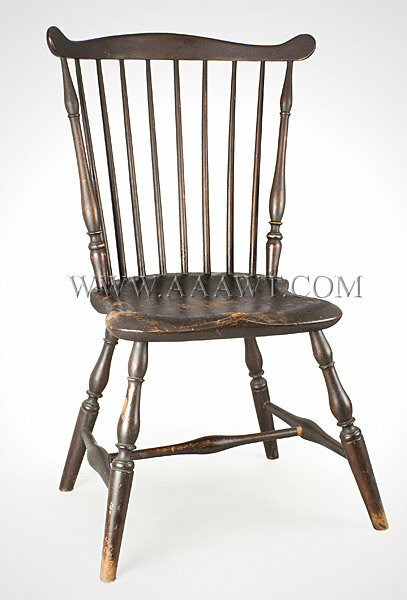 Additionally, the chair is constructed entirely of ash, a wood more familiar to immigrant turners than the maple used for the posts of virtually all other New London County turned-chairs. 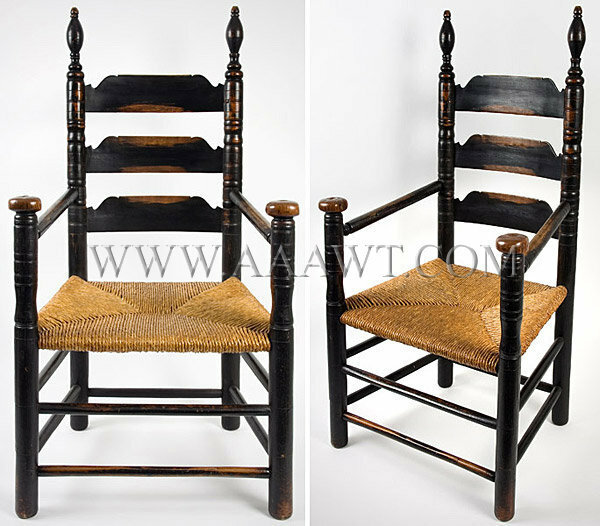 This New London County great-chair has sustained some loss and damage during the course of its use. 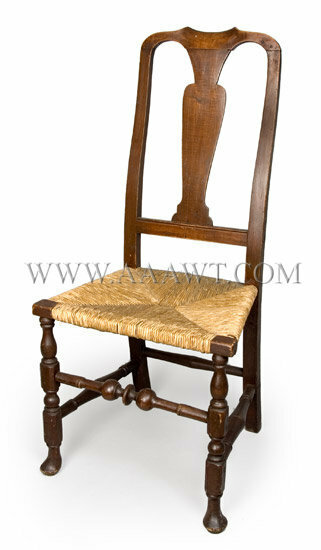 However, the visual and academic importance of the chair balances any issues of condition. 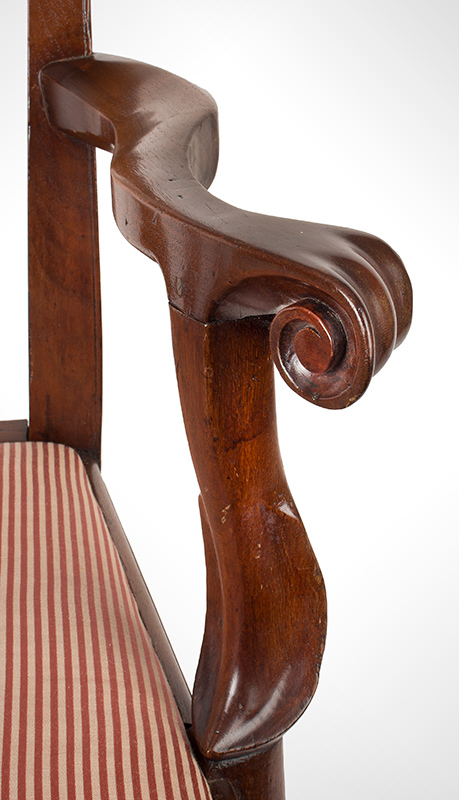 When old upholstery was removed, the shaped profiles were lost from the upper edges of the slats. 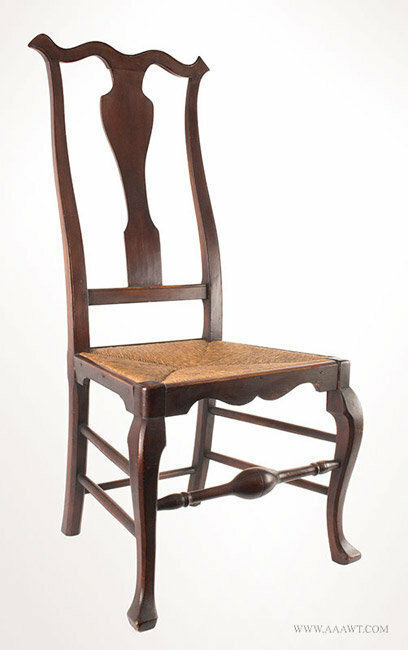 These missing elements have been restored based upon the pattern of other intact New London County turned-chairs. 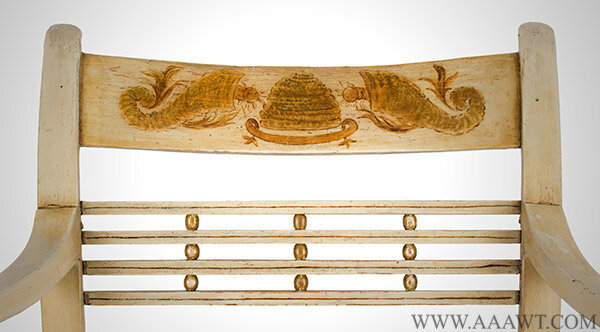 The posts have been extended about 6", although the lower row of stretchers is intact. 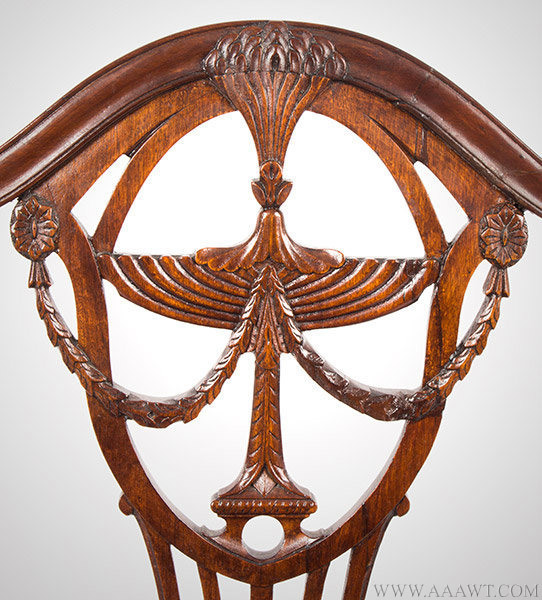 Probably during the 19th-century, a horizontal brace was installed behind the finials. 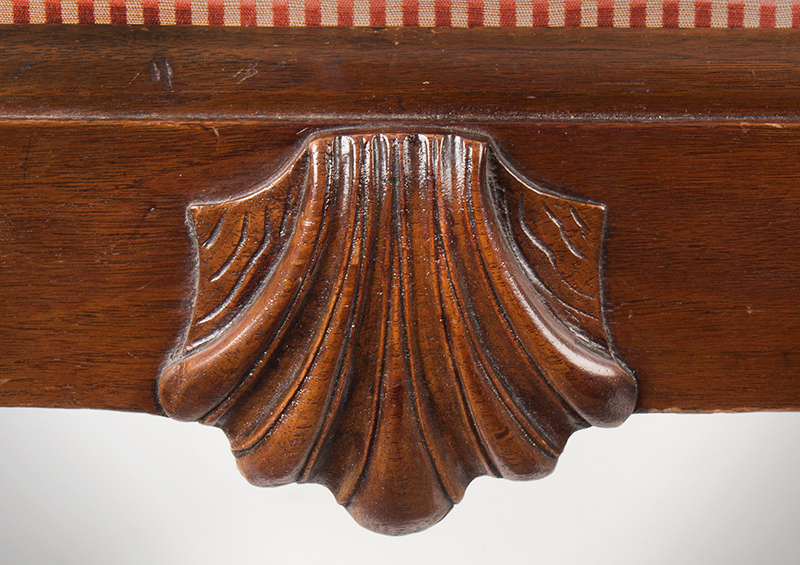 This addition necessitated the removal of the back profile of the finials and top section of the posts, a missing element also recently restored. 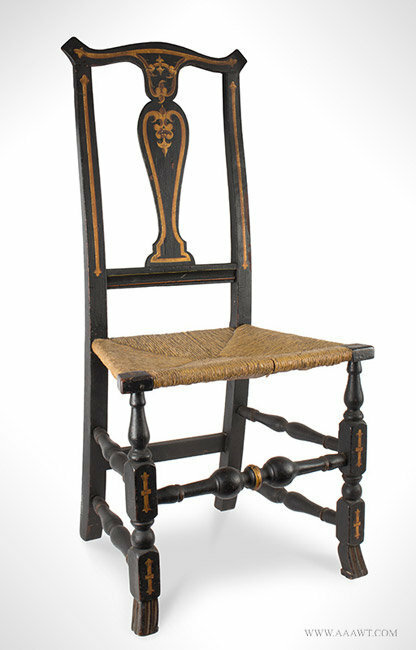 The present coat of black paint dates to the 20th-century. 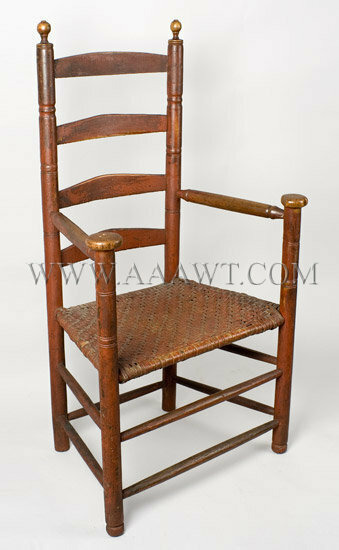 Another New London County turned-chair with unusually heavy ash posts is owned by the Museum of Fine Arts Houston and is illustrated in American Decorative Arts and Paintings in the Bayou Bend Collection, p. 2; catalog entry f-2. Other information is available by request. 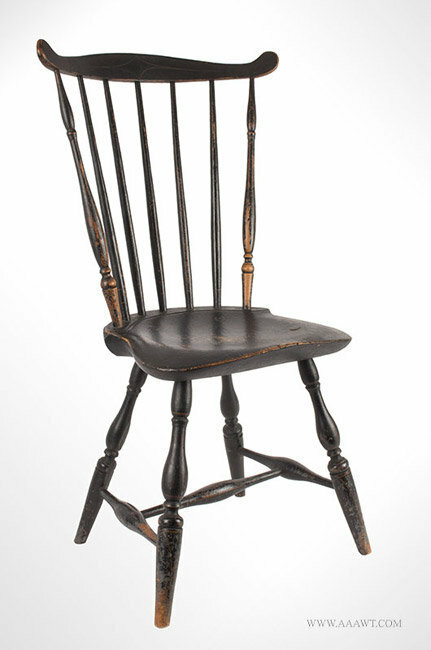 The turned Queen Anne posts transition beautifully to the crest rail and center the Boston-style "fiddle-back" splat; the arms, intermediate spindles/stretchers (under arms) and stretchers are closely related to the Durand (Milford, CT) shop vocabulary. The underside of one arm terminus is restored, all else fine. 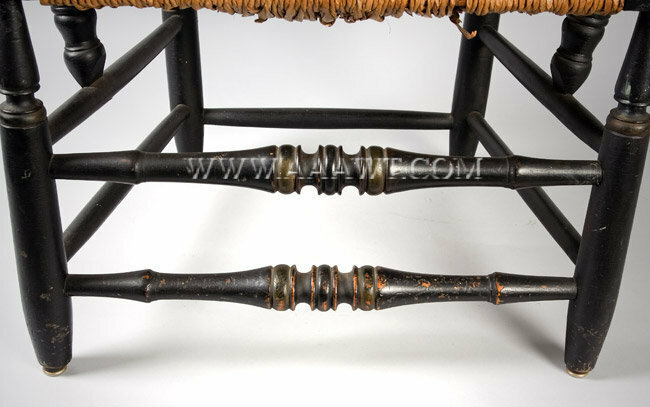 The molded banisters beneath a yoke shaped crest centered by turned rear posts featuring ogival molded terminals; elegant serpentine arms with scrolled handholds; sausage turned front stretchers. 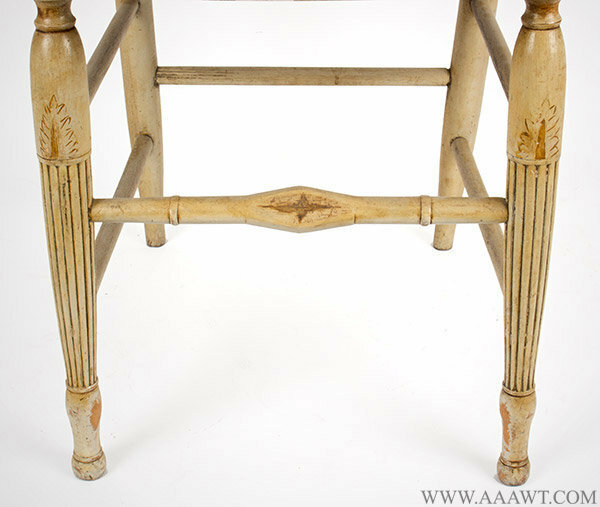 The feet are intact; old brown paint. 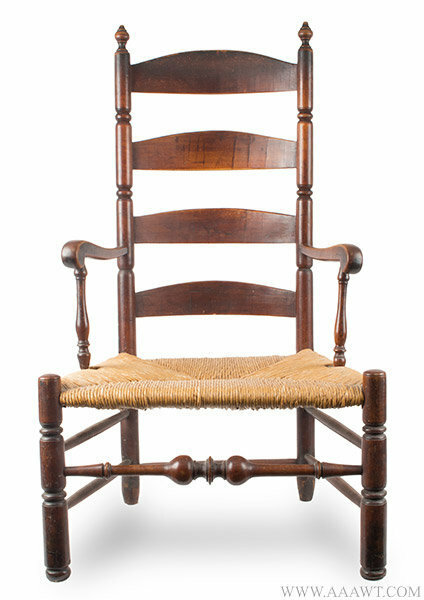 Dimensions: 45" H, 15.75" seat H, 24" W, 21" D.
Probably Providence, Circa 1780 to 1785. 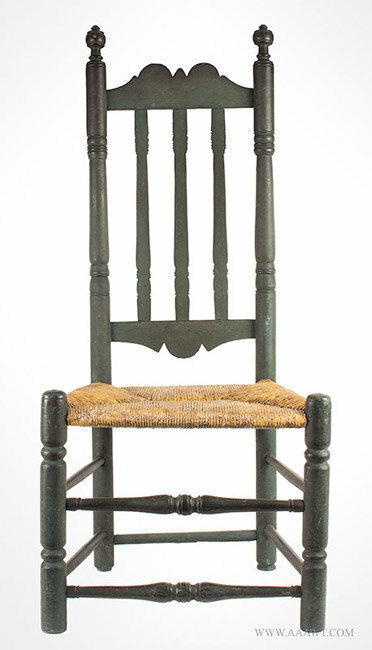 Nancy Goyne Evans discusses these rarely encountered post war chairs on pp. 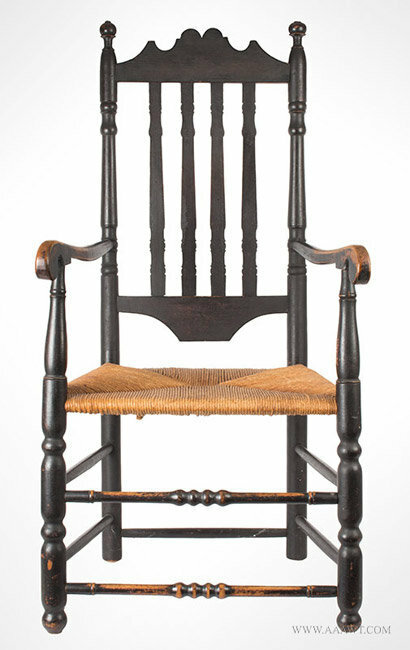 248-250 of American Windsor Chairs; also in Art and Industry in Early America: Rhode Island Furniture, 1650-1830, pp. 116, 118-19. Avg. H: 33.25"; avg. 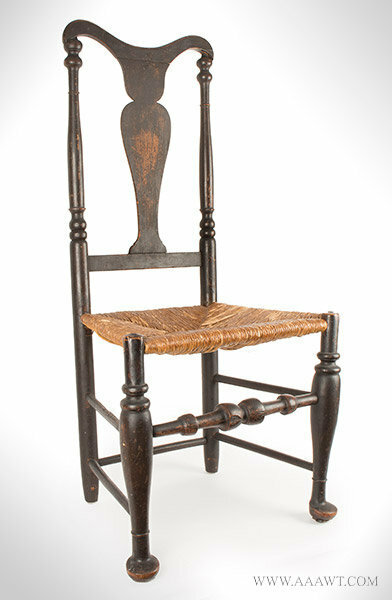 seat H: 16.5"; avg. W: 17"; avg. 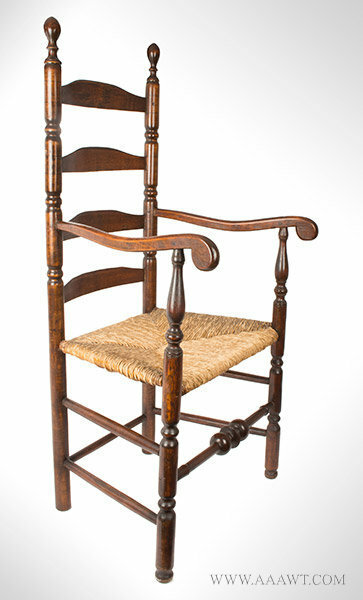 D: 16.5"
Stepped pillow crest continuing to flat curved arms ending in circular out-turned handholds supported by turned posts above rush seat raised on block and baluster turned legs joined by double box stretchers. 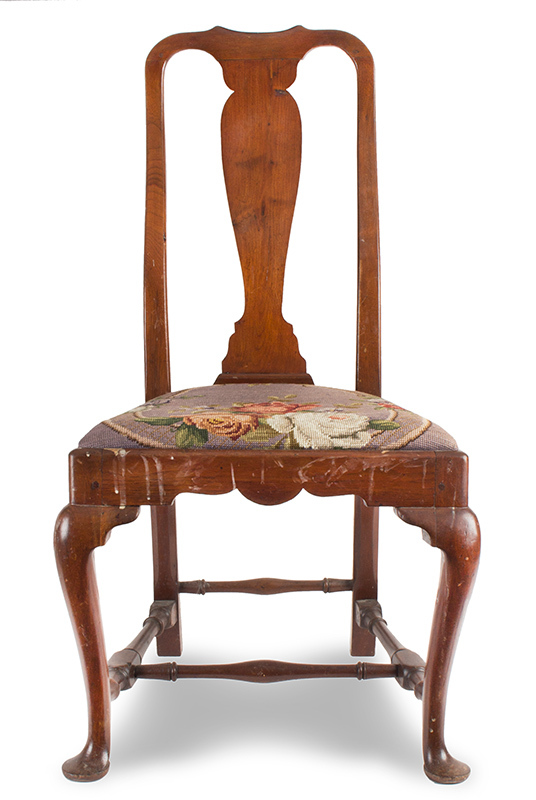 The front leg is raised on a Spanish foot with others raised on turned feet. 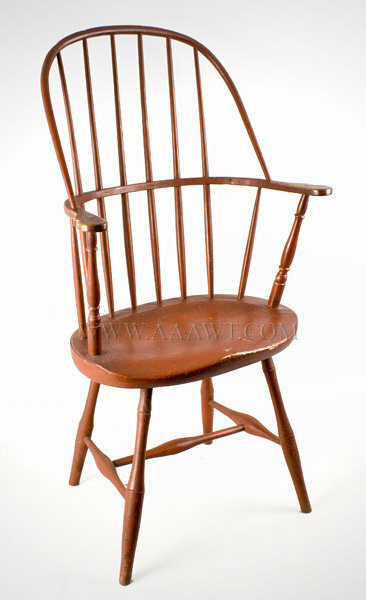 Nice old brown color. 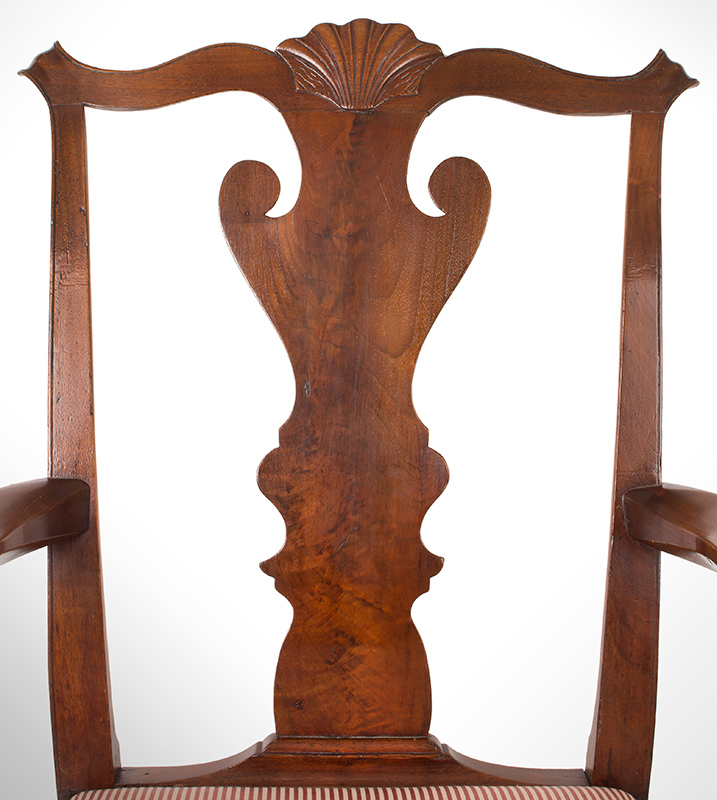 The heavy, square-cornered, S-curved arm supports on bow-back armchairs originated in Boston; an interpretation of the Philadelphia model (as discussed in Evans) with variation in the arm supports. 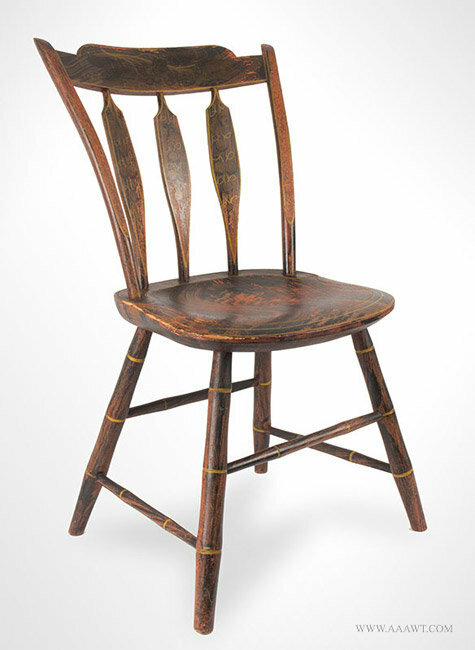 The bamboo spindles of Boston chairs are also better modeled, and the bow waists are more pinched. 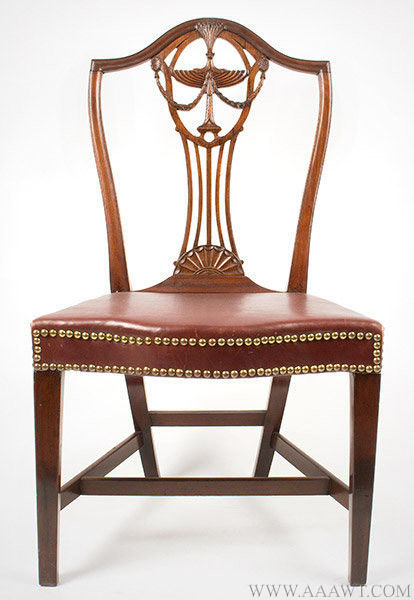 The bow faces mimic the Philadelphia model, being crowned with a scratch bead at either edge. 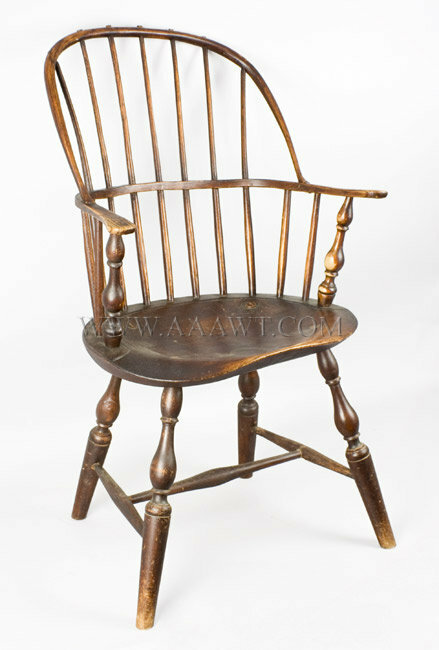 More typical of New England work is the flat bow face with scratch beads. 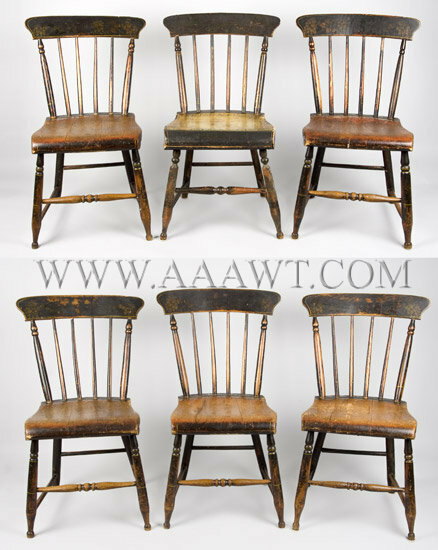 Please note that there is some variation in the subject chairs when compared to those published within American Windsor Chairs, although the two documented chairs in the book are from the same shop-William Seaver and Nathaniel (not James) Frost-one of several Boston shops active during this period. 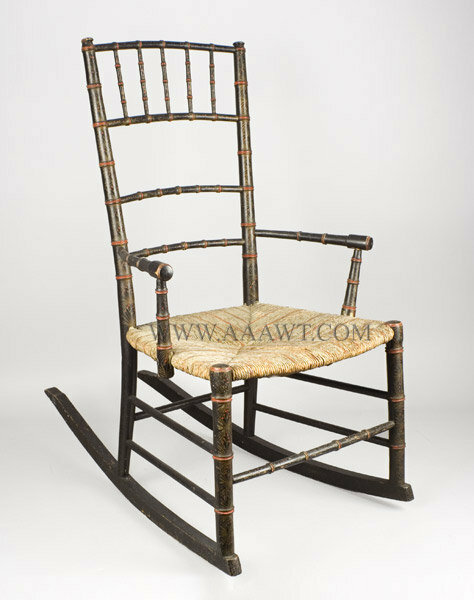 The seat shaping and the proportions of the bamboo legs vary from shop to shop. 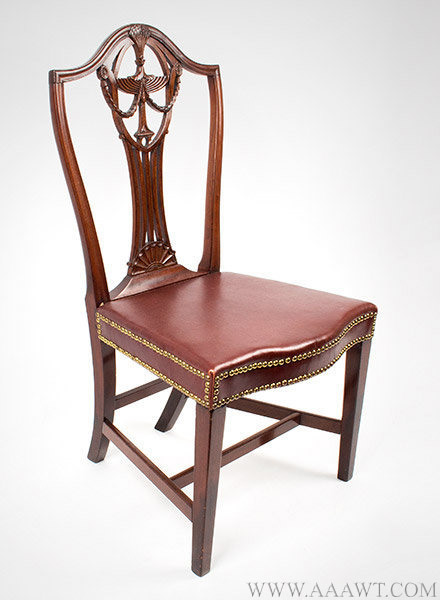 There is only one other instance of the use of squared, S-curved arm posts in American Windsor Chairs, and that is in the Rhode Island chairs of fig. 6-16. 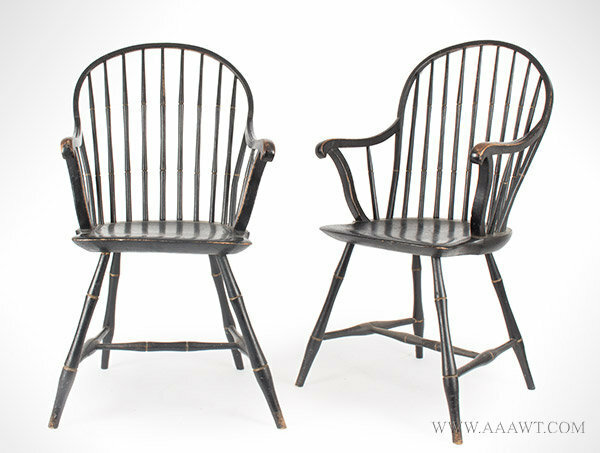 These chairs are 20 years earlier in date, however, and they represent a short-lived independent interpretation, which probably owes more to English than to American design. 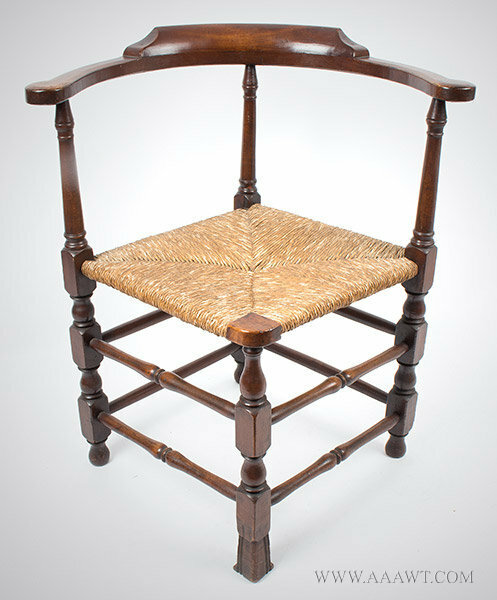 The arched and spurred crest centered by knopped urn finals atop turned posts flanking four turned and split spindle banisters over trapezoidal seat raised on block and turned legs joined by stretchers. 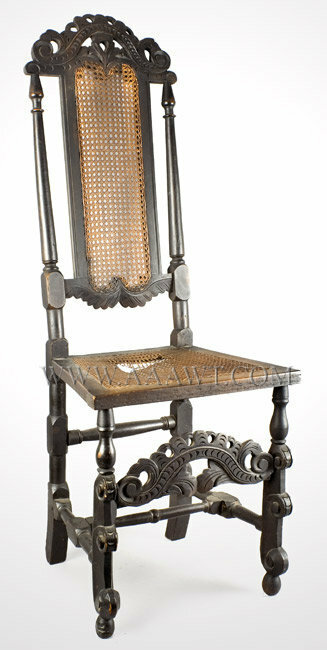 The openwork scrolled crest above tapering stiles centering the caned back, caned (imperfection) trapezoidal seat above turned, carved and scrolled front legs ending in ball feet; rear legs are blocked and turned. 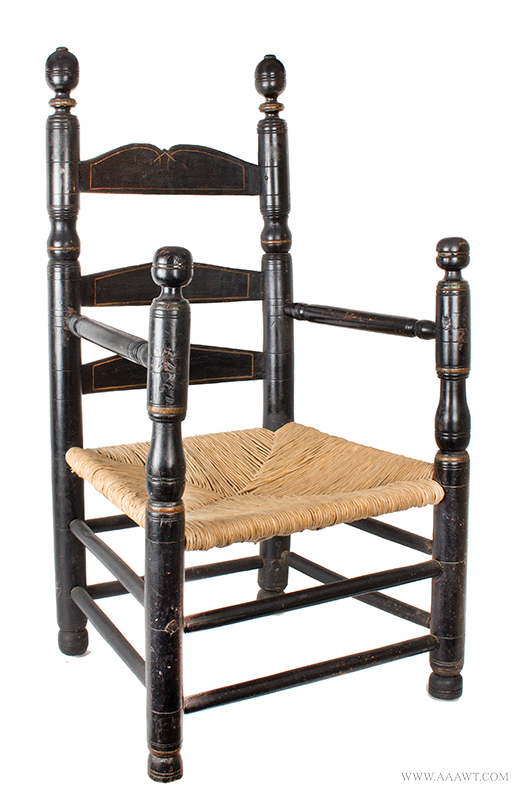 The legs are joined by block and ring turned stretcher; front legs joined by carved openwork stretcher. 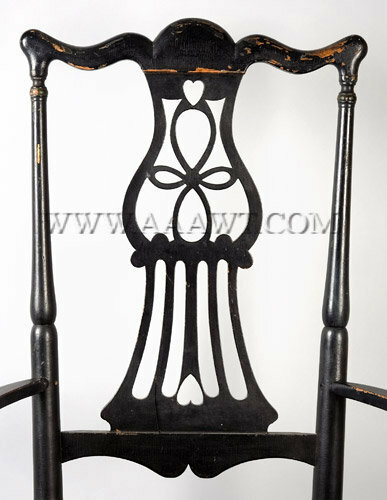 Dimensions: 48" H, 18.75" seat H, 17.75" W, 14.5" D.
A rare and very good example of the form featuring cutout heart within the domed and pierced crest rail above four molded banisters centered by robust turned back posts and finials; a variant of the "heart and crown" tradition. 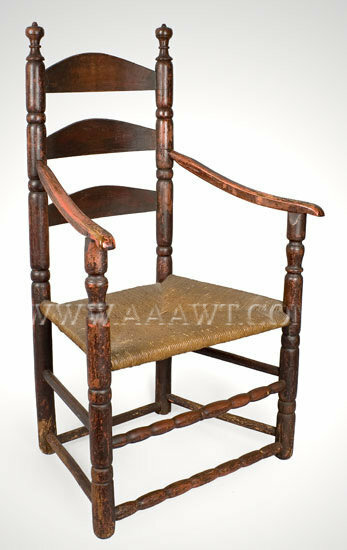 The shaped arms and handholds above a turned stretcher joining front and back posts; trapezoidal seat raised on turned legs joined by double front and side turned stretchers. 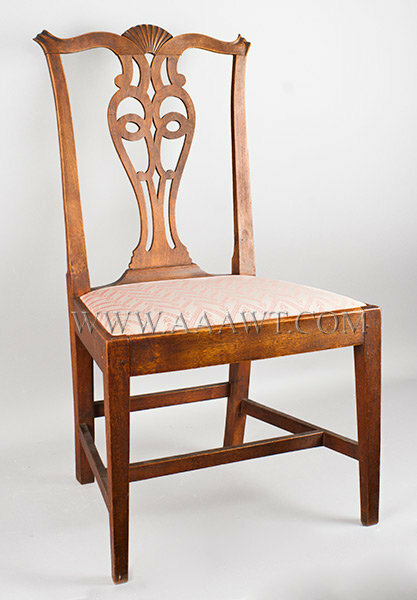 The chair has a rich patina and remains in fine condition having lost less than one" of height. 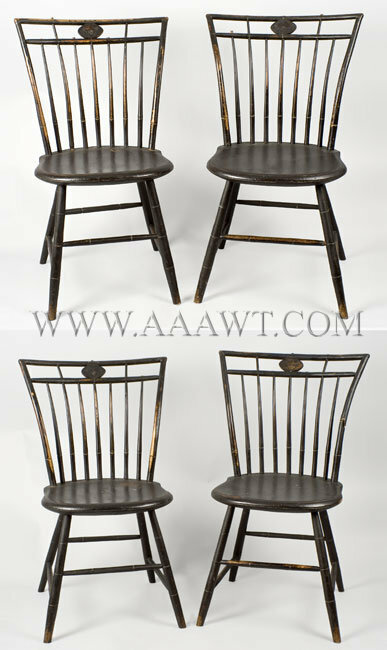 (H: 46.25"; seat H: 16 3/8"; W at widest point is 24 3/8") See Connecticut Furniture of the Seventeenth and Eighteenth Centuries, Wadsworth Athenaeum, 1967; plates 211 and 212 for nearly identical examples. 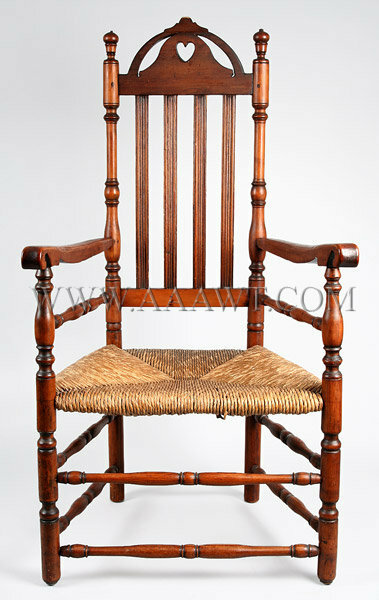 Nine tapered and swelling spindles within incised bow above the shield shaped seat, raised on bamboo turned legs joined by "H" stretcher. 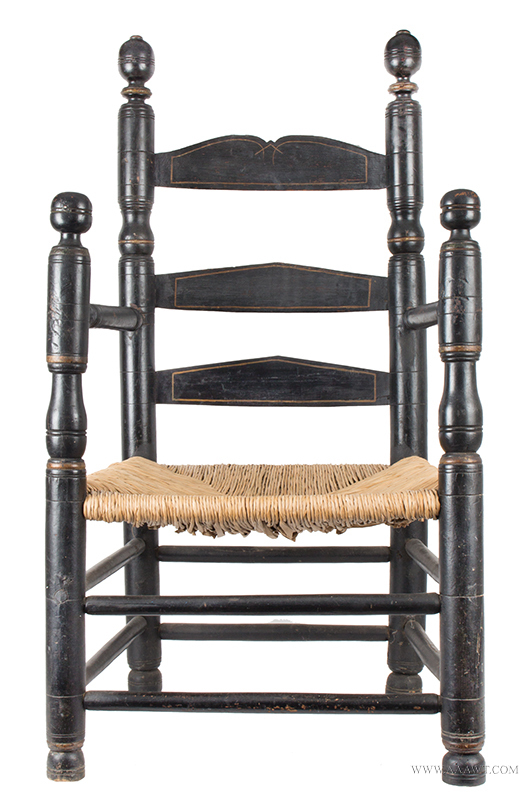 The chairs are full height. 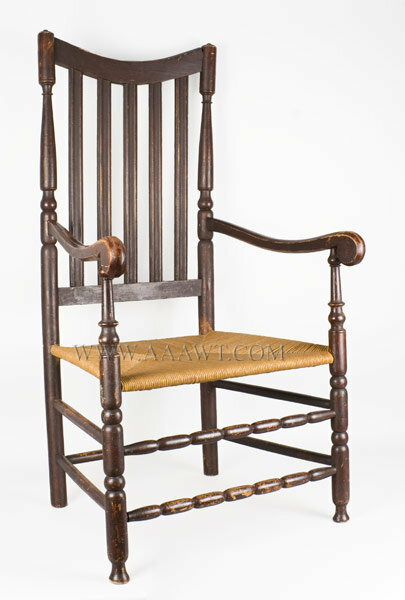 Dimensions: height to back- 37.875"; seat- 17.75" tall, 17.5" wide and 15" deep. 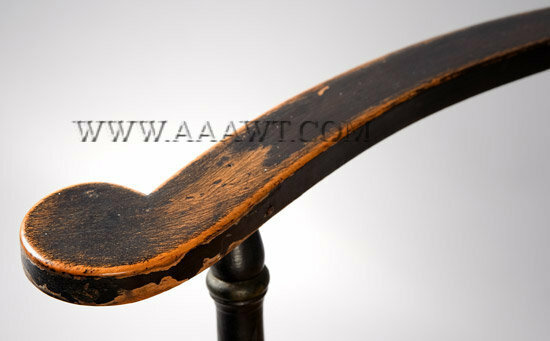 An arm and bottom front stretcher is replaces, other minor imperfections reflected in price. 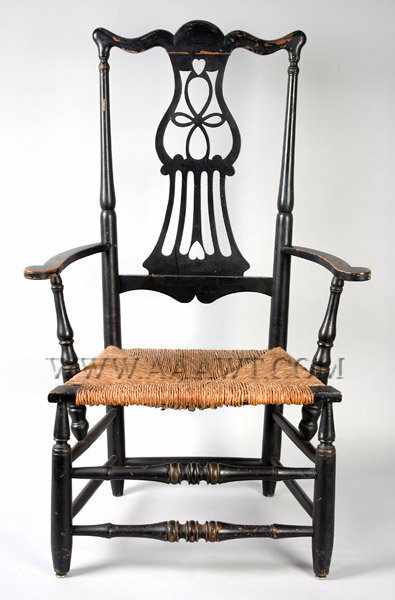 Dimensions: 48.75" H, 18" seat H, 23.75" W, 20.25" D.
The shaped crest with ears above eight turned spindles flanked by turned posts a saddle seat, on ring, reel, and baluster-turned legs joined by H-stretcher; all in the stylistic tradition of the Tuttle shop. 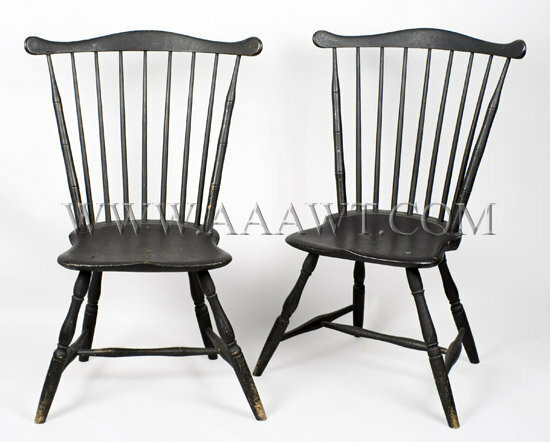 For nearly identical documented Tuttle Windsor chairs see Nancy Goyne Evans, American Windsor Chairs, pp 366 and 367, fig. 6-219. 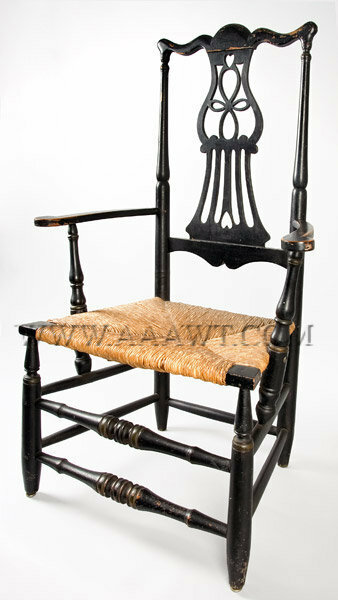 Tuttle first advertised Windsor chairs in 1796. 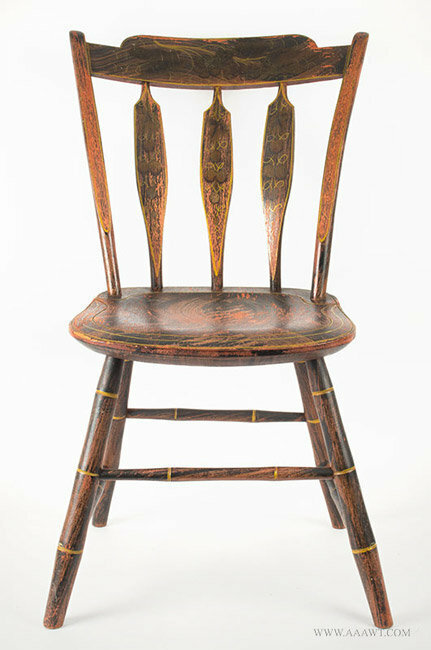 According to Evans, his chairs are the only Windsor chairs identified as being of Salem origin. 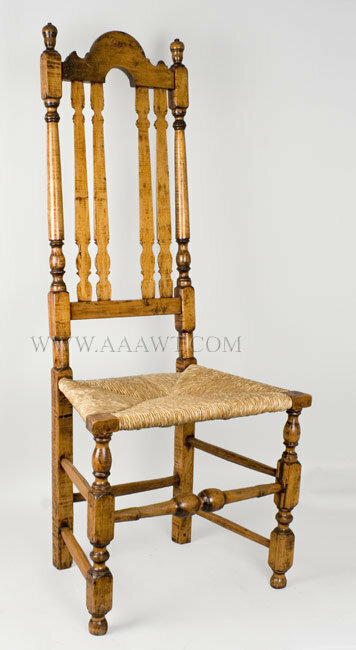 Excellent condition, good surface; H: 36.5"; seat H: 17.5"; W: 17"; D: 17". 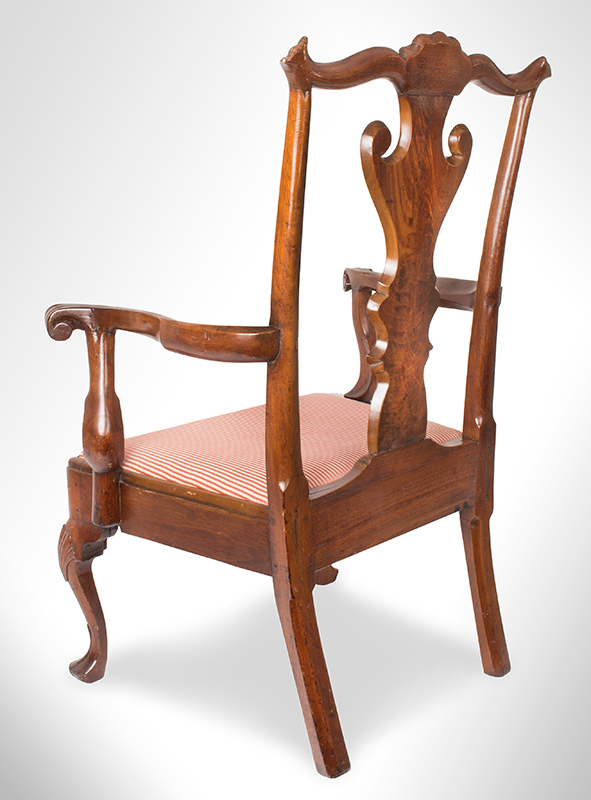 The arched and spurred crest centered by knopped urn finals atop the turned posts flanking four turned and split spindle banisters over trapezoidal seat with front corner blocks raised on block and turned legs joined by stretchers. 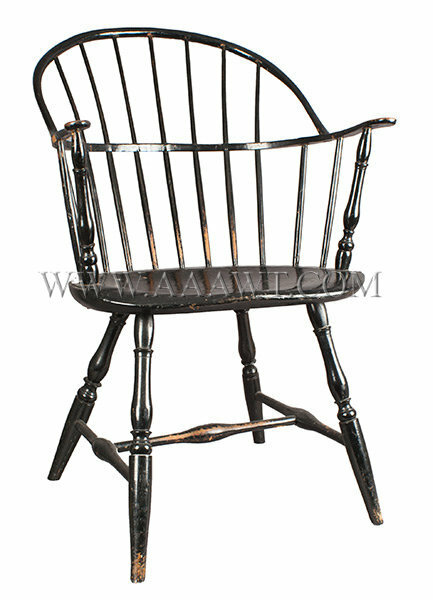 Dimensions: 46" H, 16.75" seat H, 19.5" W, 14" D.
Chairs, Banister Back, Set of Four Chelsmford, Mass. 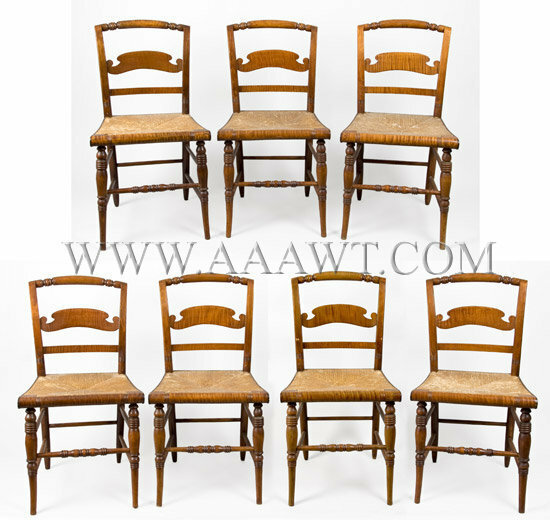 Descended in one family, and picked from the estate by the current owners. 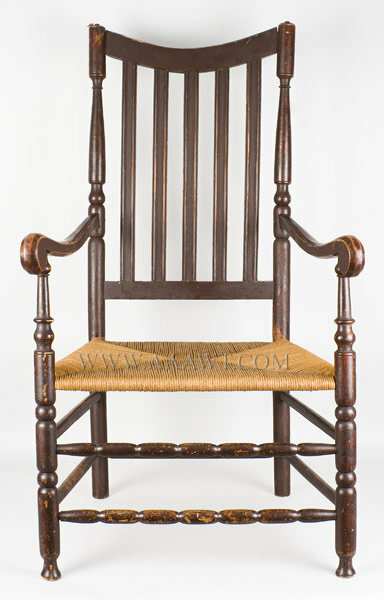 Arm chair 47.25" Tall with 16.25" seat; Side Chairs 46" tall with 17.5" seats. 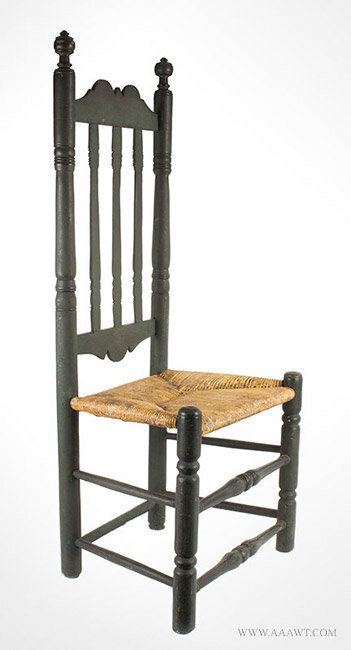 Still sturdy. 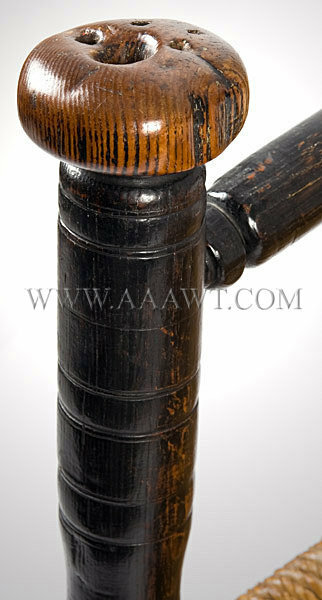 Four arched splats centered by robust sausage, ring, and compressed ball turned posts; the tall finals are original. 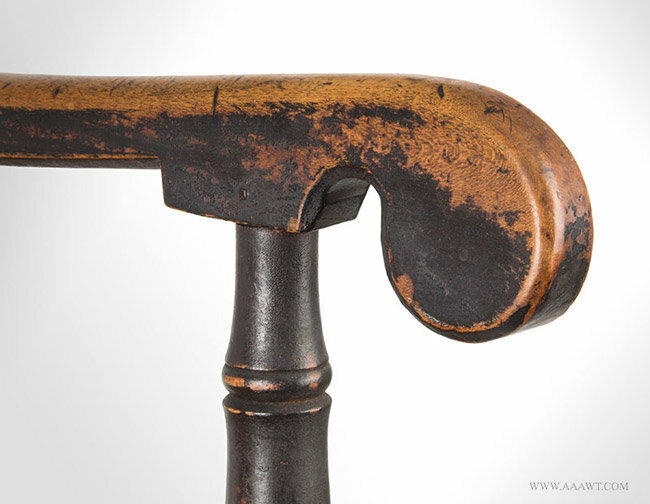 The out-swept arms with carved scrolled handholds rest on turned support that pierces seat rail, tapers and is let-into barrel turning of upper-side-stretcher. 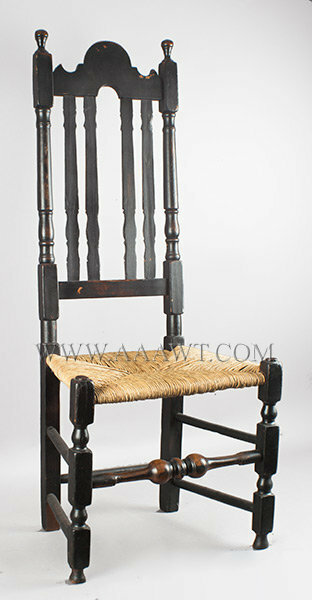 The trapezoidal seat retains original splint and is raised on turned legs joined by stretcher system. 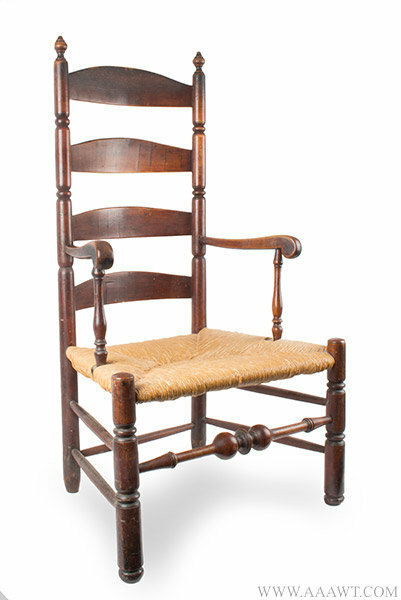 This example, always a rocker, remains in a high state of originality including rockers; one arm-support is an early working period carved "make-do". 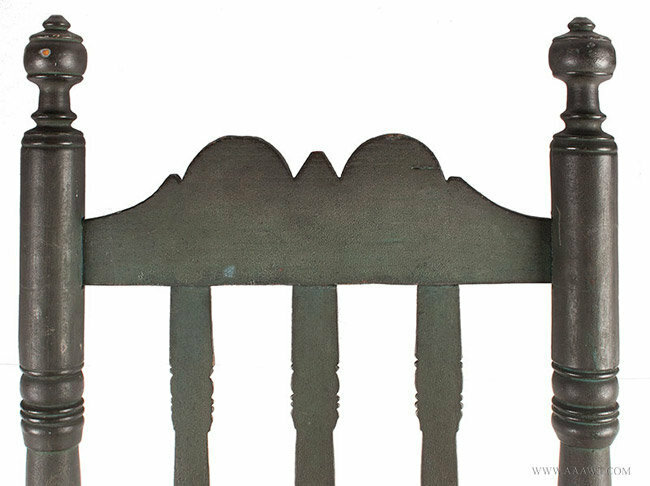 As depicted, four shaped splats centered by turned and incised rear posts retaining original finials. 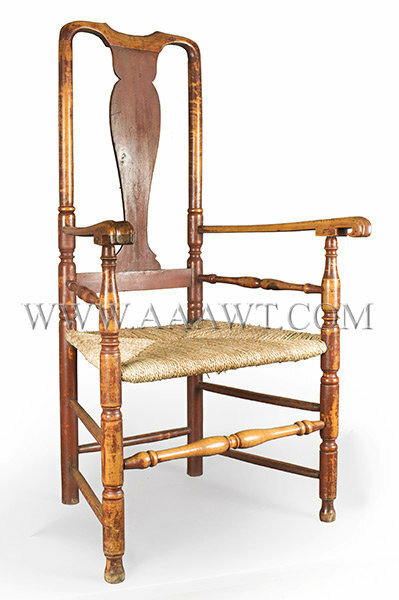 The front posts with large handholds, and rear posts are similarly turned and incised and are joined by robust arms and double stretcher arrangement. 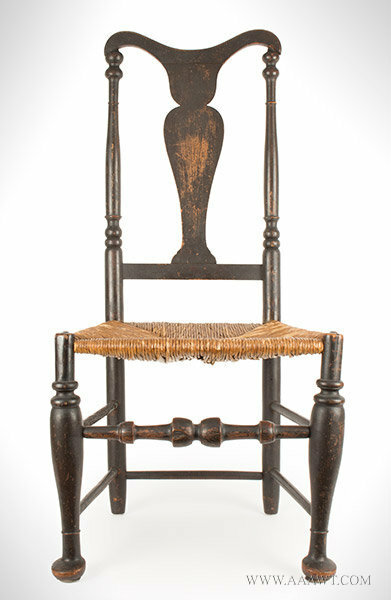 The trapezoidal seat is woven ash-splint and may be original. 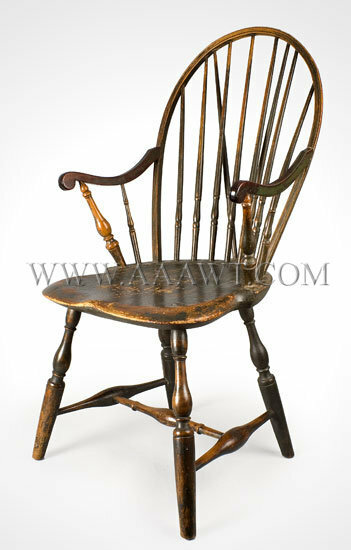 Lovely crusty 19th century red paint over darker paint; great surface and patina. The rear legs are ended-out with 3.75" being pieces; front legs are ended-out with 2.5" being pieced. 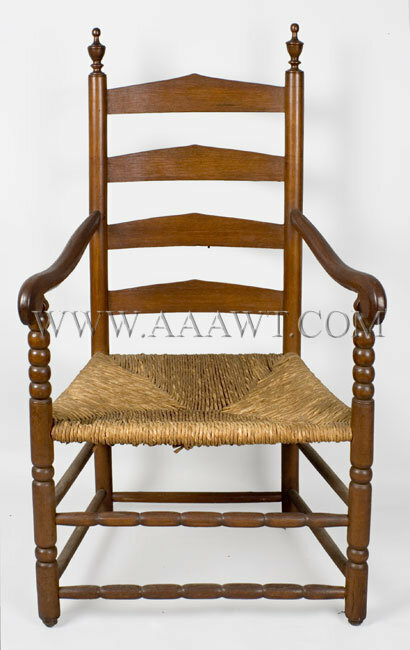 Height: 44"; seat height: 17"; width: 23.5"; depth: 15.5".